I got interested in this book because the author, S. Payne Best, was the person that Dietrich Bonhoeffer relayed his last message to. Best, when he was released after the war, delivered that message to Bishop George Bell, Bonhoeffer's friend. This book also got my interest because of the reluctance of Churchill to support Germans who were trying to overthrow Hitler (like Bonhoeffer). 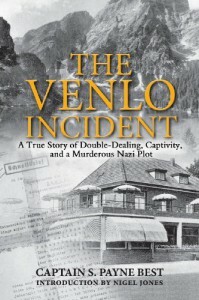 The reason for Churchill's reluctance to do that is described in detail in "The Venlo Incident".This book documents the most famous and humiliating of the British intelligence failures during the 2nd World War. Two of the British intelligence officers, Captain Sigismund Payne Best and Richard Stevens thought they were meeting with some Germans who opposed Hitler. But instead they were kidnapped from a cafe in Venlo, Holland and then taken to Germany where they remained throughout WWII, kept as VIP prisoners and tortured for information that damaged the war efforts of England. Stevens at his time of capture, even had a plain list of agents on him. Churchill, not wanting to step into another trap, never believed any of the attempts by Germans to solicit help in overthrowing Hitler. The most interesting parts of the book have to do with the chaos at the end of the war, when the Germans moved around prisoners to keep them out of the hands of the Soviets, and then later to keep them away from the Allies.